Wow! Very pretty! The colour blue is very nice in this wallie! The effects are very beautiful ,but i dont like the scan that much^^' Its cute but doesnt seem to fit in for me. Love the filter cloud effect...simple but it's still very nice. Very swirly and gives me the feeling of a slow, lazy day...cute too! WOW....so dreamy and blue. I just love the way where you always put the blue effects in the sky! This reminds me of the Care Bear's world for some odd reason..^_^' What with the little girl up in, what looks to be, the sky floating on a cloud that I have a strange urge to call Nimbus. lol Very cute wallpaper! Love the nina in the pic. lol. I like you style, but what you could do is play around with the colors, or play around with different effects like "chrome" and stuff. I think you are still doing great tho. Keep it up. love what you did with the sky it's pretty cool! and the scan is well blended to the background! The wallpaper fly me back to my younger days as soon as I see it. 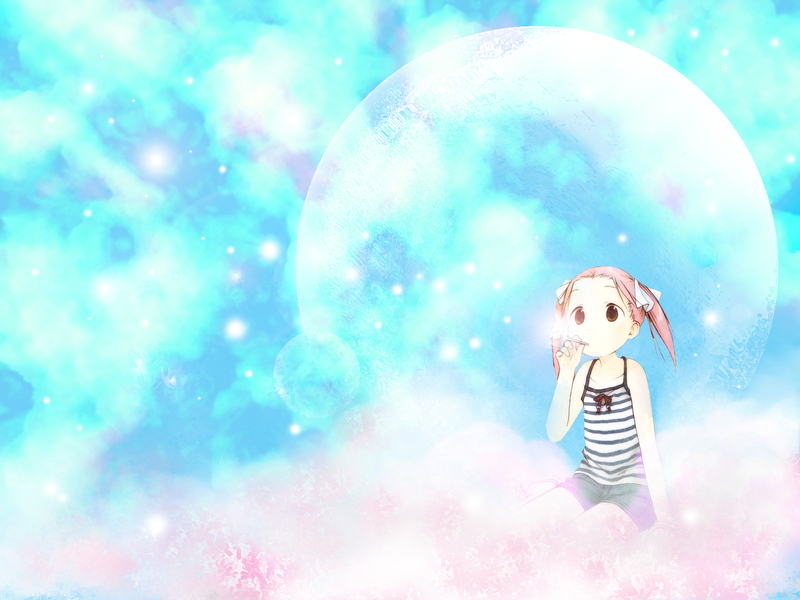 Sitting on the blue sky and make soap bubbles.... what a peaceful day. Magician Fairy Senpai picture the feeling very nicely, the placing of the character, the blue color, the brightness and the "cool" sense of the pic... they are all beautifully arranged and placed.